While our boat still hasn’t made her big road trip down to Florida yet I’ve been filling my days finishing up as many of my sewing projects as possible so that I at least feel I’m making some sort of progress on our giant list. Given half of my sewing supplies and projects pieces are stored safely inside of the cabin, I can only do so much. 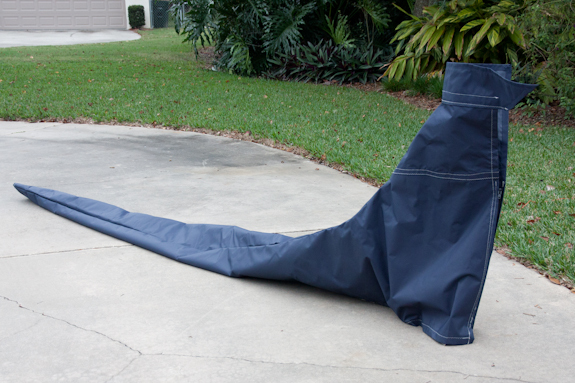 Luckily I was able to finish our new sail cover. I’m so excited with how great it turned out! Now that I have a new fancy sewing machine these projects go a lot faster and are completed with significantly less inappropriate language. This project was pretty simple. Chance came with a sail cover but it was old, faded and an ugly poop brown color. We wanted to update the cover so it would match our dodger (my first and still unfinished project. My window material is being held hostage on our boat) and our new paint job. If you have an existing sail cover and want to recreate the same cover, I’ll walk you through the steps of how I made mine below. Scale: 1; I’ve never sewn in my life and I could do this – 10; I should just go ahead and work as a costume designer on Broadway or something else really impressive. Step 1: Examine your existing cover and decide if you want to make any adjustments so we can edit our pattern for these later. In our case we wanted to make the cover a little deeper and add zippers where there were ties. Step 2: Mark each of the panels on the front side so you can keep track of the pattern easily. For example, my cover had 5 pieces and I labeled them as: Top wrap, left top, right top, left bottom, right bottom. With a sail cover it is pretty easy to piece to together the panels just by the shapes but this step just ensures you’ll get it right. Step 3: Using a seam ripper rip apart all the existing seams so you are left with just the fabric panels. Step 4: Iron out seam creases enough so they lay straight. You still want to be able to tell how big the folds and seams were originally. Step 5: Layout your Sunbrella or “Sunbrella-like” material back side up and configure your panels so that you maximize the new fabric’s usable space. Be sure to pay attention and lay your panels out back side up as well. Step 6: Trace the panels onto the back side of the fabric using a chalk pencil so that the markings will brush off later. Mark each panel with its name so you can match it up to the pattern when we start to sew the pieces back together. Step 8: Take the bottom right panel and fold the top edge down (so that the top sides are touching) 1/2 and inch and iron to crease. Then, take the top right panel and fold the bottom edge under (so that the back sides are touching) 1/2 and inch and iron in to place. Step 9: Line up the panels so that they match up and tape into place using basting tape. 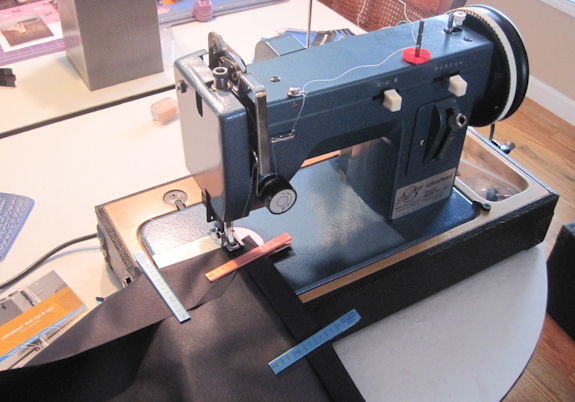 Step 10: Using a zigzag stich, sew the panels to each other, one line on each folded seam. See the image below towards the center of the image. Step 12: Repeat steps 8-10 with the top and bottom left panels. Step 13: Take the left panel and fold the side edge under 1/2 and inch (back sides touching) and then under again 1 inch. Iron to crease. Step 14: Repeat for the bottom seams. You may need to cut a triangle piece of fabric off of the corner so that the side and bottom seams lay flatter. Repeat for the front edges as well. Step 15: Using the zigzag stich sew the seam edge down as close to the edge as possible. Step 16: Repeat steps 13 and 14 with the right panel. Step 17: Lay your right and left panels along side each other, back sides up so that the side edges are lined up and touching. Step 18: Take the 36″ zipper (zipped) and lay it along the edge of the newly sewn side seam (top side of zipper laying on the back side of the panel), approximately 2 inches from the bottom edge. We wanted our zipper to zip up, but that can be your choice. Using your chalk pencil mark the zipper bottom edge on the panels, then ever two inches make a mark on both the panels and the zipper edges so that you can make sure the zipper lines up properly. Step 20: Using the basting tape tape the zipper onto the right panel ensuring the chalk markings line up. The zipper edge should line up with the edge of the panel so that once it’s sewn into place it will be protected from the sun as much as possible. Repeat for the left side. Step 21: Using a zipper foot (if available, I did mine with a regular foot) on your sewing machine sew a straight stich as close to the zipper teeth as possible. There should be at least 1/8th of an inch between the zipper teeth and your thread so that the zipper can properly open and close. Step 22: Using a zigzag stitch sew the front (short) edge of the cover into place. Step 23: Repeat 17 – 21 for the bottom zipper. The zipper should not run the length of the bottom. Line it up 2 inches from the front (short) edge. Step 26: Sew another line of stitches along the other, just slightly closer to the edge so that the seam is extra strong. Step 28: Sew the side and top edges into place. Step 29: Line up the bottom edge of the top panel to the top edge of the cover. Step 30: Using the basting tape secure into place. Step 31: Using the zigzag stitch sew the bottom edge into place. Then, sew the top edge into place. You can use either a zigzag or straight stich here. Step 32: The one step that I have yet to do is sew the cord to the top panel. I’m not sure if I am going to use a bungee/shock cord here or just a regular cord similar to what was on the original cover. If you are going to use regular cord, the original cover had about 3 feet of cord sewn with multiple rows of zigzag stitch to the top panel corner. Step 33: Get out on the water and use it! Caveat: I am by no means a professional seamstress (get it? HA!) and this could fall apart once we’re on the water (doubtful, but who knows). These are just the steps I took in recreating my sail cover and I’m pretty proud of how it turned out. Hey Kelley. I want to use this post and your “my office” post for Monkey’s Fist. We’re doing a sewing topic and launching in August. Is that cool? Hi Drena – Absolutely. I actually submitted a few links via facebook that I thought were appropriate. Good luck!